The Clackamas River flowing into a side channel along Fisher’s Bend. Fisher’s Bend is a site along the lower Clackamas River at river mile 11.1 – 11.8. 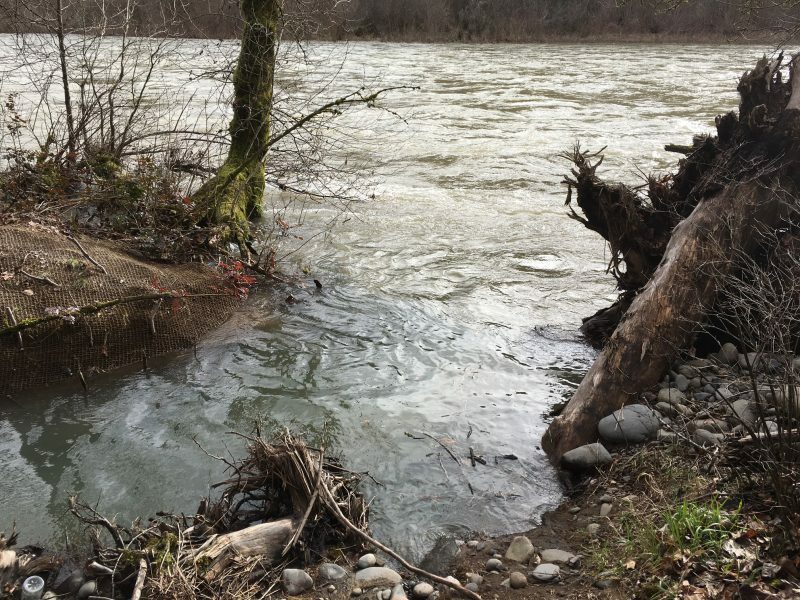 The lower Clackamas River is used as a migration corridor and rearing habitat by salmon and steelhead, but because of extensive loss of historic habitat, the river is a high priority target for restoration. The Fisher’s Bend riparian habitat had been isolated from the main stem of the river, except in very high flows. Project partners identified this bend in the river as a potential site for habitat restoration because its ecological value and the willingness of local landowners. Over 5 years of planning and restoration have gone into this restoration project – a commitment we are proud to have made to the fish and wildlife we serve! Alcove enhancement – Alcove enhancements completed during Phase I reconnected the mainstem of the lower Clackamas River to its floodplain, restoring critical habitat diversity and hydrology. In order to reconnect the mainstem to its floodplain, approximately 970 linear feet of off-channel habitat was constructed. Large wood and dense plantings of water-loving plants, such as willows and dogwoods, were installed to stabilize the channel and provide sheltered habitat. Side channel reconnection – Side channels provide vital refuge and rearing habitat for threatened juvenile salmonids at critical life stages. During Phase II, a historic side channel upstream of the alcove was reconnected for an additional 2,350 feet of off channel habitat during high flows. This side channel is activated a few times a year and was designed with boulders, large wood, and gravel to dissipate flows. Invasive weed management – Invasive plant removal and revegetation of native plants in the riparian zone around the side channel offer additional shade, soil stability, runoff filtration and habitat diversity. In total, 4.5 acres of habitat have been restored with this project.